The first of my reviews from this four-part blind tasting of Old Pulteneys posted yesterday. That was Old Pulteney 12yo (2016). 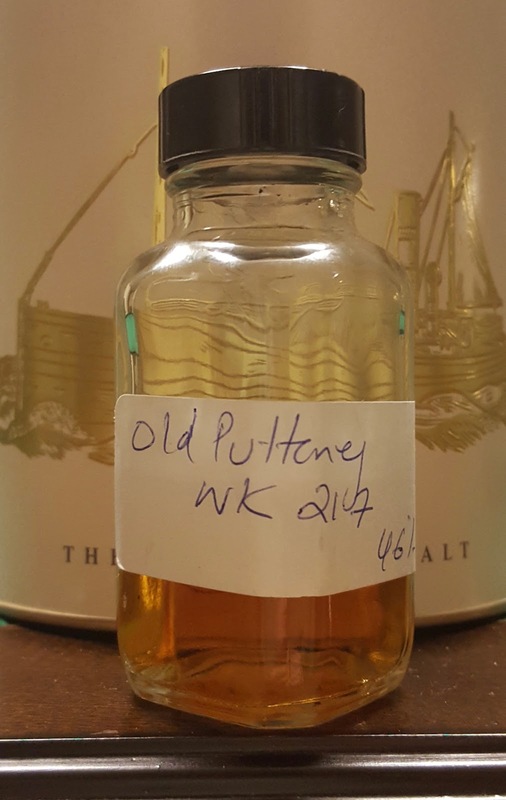 Review #2 is of Old Pulteney WK 217 Spectrum. WK 217 Spectrum was third of a three-part series of whiskies named after Wick fishing boats. They were each a little different than the next, though were all NAS and sold through travel retail. I knew nothing about this whisky when I requested it during a sample swap with Mr. My Annoying Opinions. Its color is the darkest of the bunch, slightly lighter than maple syrup. Speaking of which, there's touch of maple syrup in the nose, though the fruit notes are much larger: dark cherries and raspberry fruit leather. There are hints of carpet, plastic and moss to give it an edgier dimension. Defined dry sherry notes in the palate. Raisins and walnuts. Marshmallows and black peppercorns. It gets sweeter with time, trending towards a Macallan style. Though it has a slight bitter bite throughout. Its finish is nutty, with moments of dried currants. Bitter coffee in the back of the tongue. A little bit of heat. Gets more sherry forward with time. Yum. Though not classically Pulteney in style, WK 217 Spectrum is a pleasant sherried thing. It took me by surprise, since I was expecting to like this Duty Free Mystery Meat the least. Instead it was either my favorite of the four, or tied in first. I can't say it's that complex, nor has had a particularly lengthy maturation, but there were some sopping sherry casks in the mix. I'd take it over the current version of Macallan 12. I don't think it's better than Bunnahabhain 12, but it's within a step of that one. MAO liked the WK 217 slightly less than I, but seems to agree that it's "solid sherry" stuff. Too bad it's gone from Duty Free, as it was sold in liter bottles! Pricing - dunno, maybe $80 for 1L?